This weekend (19 & 20 March 2016) was the Southbank Centre's Chorus Festival, where choirs from around the UK sing at various locations within the Southbank. Amongst the choirs performing was the fantastic Choir with No Name which deserves a special mention. The Choir with No Name provides rehearsals with a meal for homeless men and women. 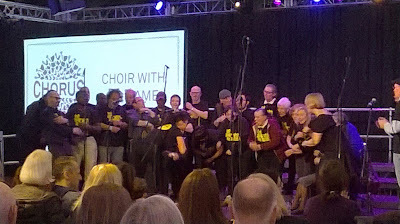 Since they started with a single group in 2008, they have expanded and currently there are four choirs, two in London, one in Birmingham and one in Liverpool. Regular gigs help raise money to keep the charity afloat. I first saw them last Christmas, filling the stage at the Royal Festival Hall, and bringing their own indomitable approach to the festive season. Upcoming gigs include a comedy night in London, and a spot at 'Community Spirit 2016', in Birmingham. On Saturday (19 March 2016) their fearlessness and enjoyment easily put other choirs to shame. There may have been nerves, but these were well hidden, and with no music to hide behind, the choir infected the audience with their enthusiasm. Well done to the performers, musical directors, and the team for reminding people why it is good to sing.